Carrot cake is such a comforting food. 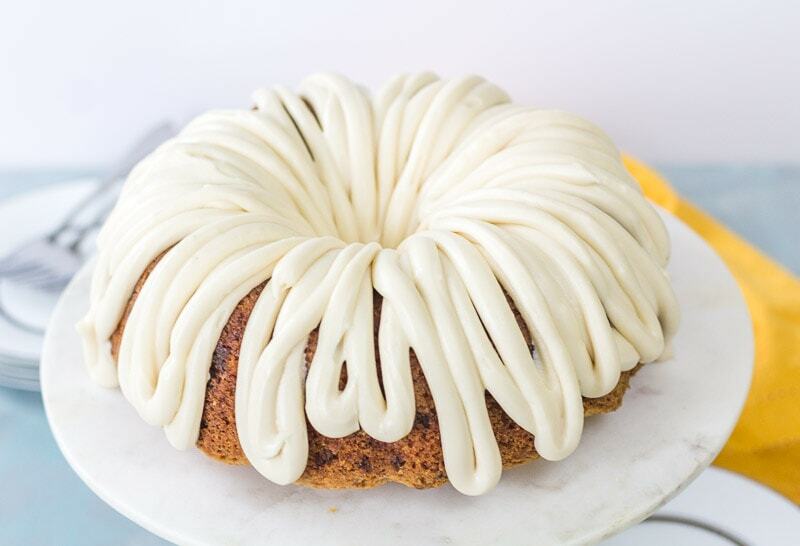 It’s a classic, so I didn’t want to change it up too much, but I DO like to keep things interesting, so I came up with this caramel carrot cake. I think the rich taste of the caramel works really well with the spiciness of the carrot cake. I’ve even added in a bit of caramel to the classic cream cheese topping. 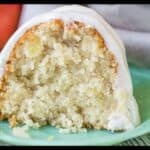 This cake is a bundt cake with the glaze drizzled over it, because sometimes you just don’t feel like the whole production of a layer cake. 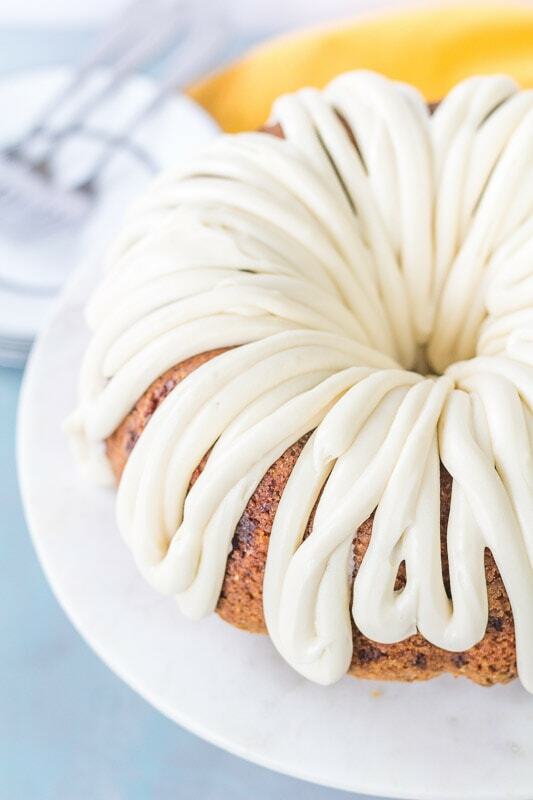 Bundt cakes make life easier. No having to stack and fill cake layers and then getting the outside to look all perfect. Just add the glaze to a piping bag, snip off the end and squeeze onto the cake. It’ll look like you worked all day on it! Ok, back to this cake. You’re using real shredded carrots in this one. 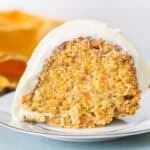 I’ve had several people ask me, “Carrot cake has actual carrots in it?”. Yes, it does. I always get a little confused when I’m asked that. I mean, apple cakes have apples, pumpkin cake has pumpkin, zucchini cake has zucchini. 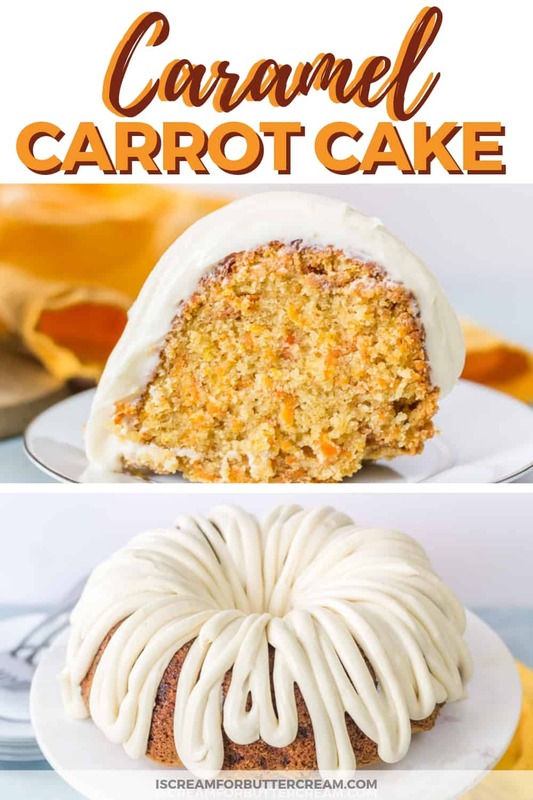 I guess it’s hard for some to imagine putting carrots in a cake and it coming out actually tasting good. 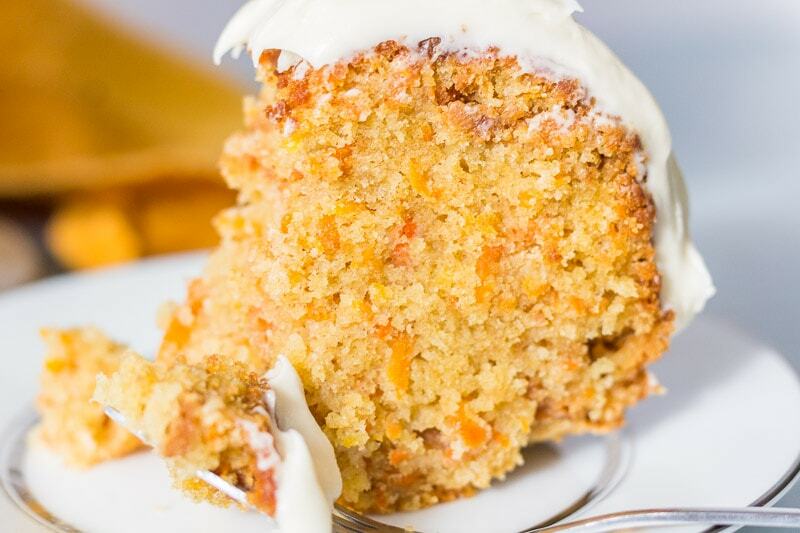 I’m sure you’ve tasted carrot cake before, but if you haven’t…trust me…it’s good. 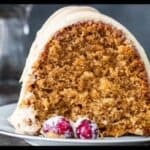 This caramel carrot cake is a moist, dense textured cake. The combination of the carrots, cinnamon and hint of caramel work so well together. You can always add in nuts or raisins if you’re a fan of that. I’m definitely not, so I left those out here. Next you’ve got the caramel cream cheese glaze on top of the whole thing…and wow, your taste buds will thank you. I ate way too much of the glaze right out of the bowl. Seriously I had to make myself stop, so I’d have some left for the actual cake. Yeah, I’ve got a problem. Ok, enough of me talking it up. I know you’ll want to test it out for yourself, so let’s get to the recipe. I’ve also included a video. 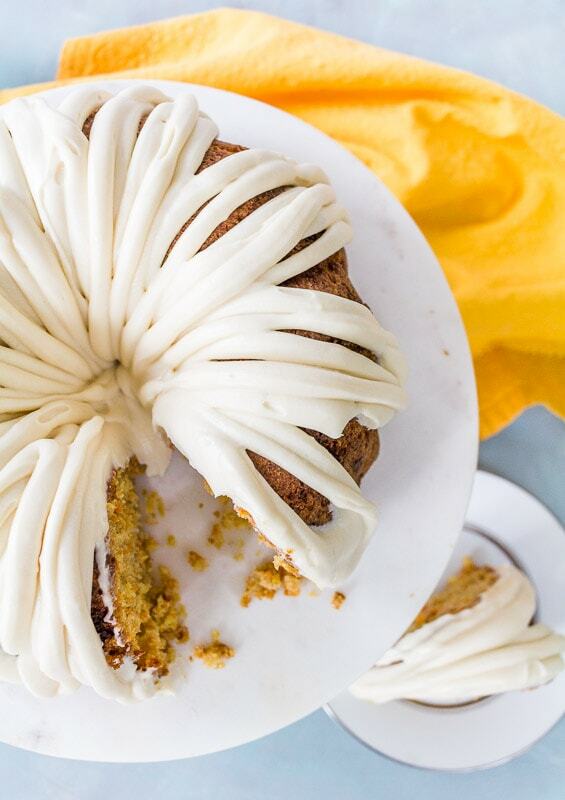 This caramel carrot cake with caramel cream cheese glaze is a new twist on the classic carrot cake. 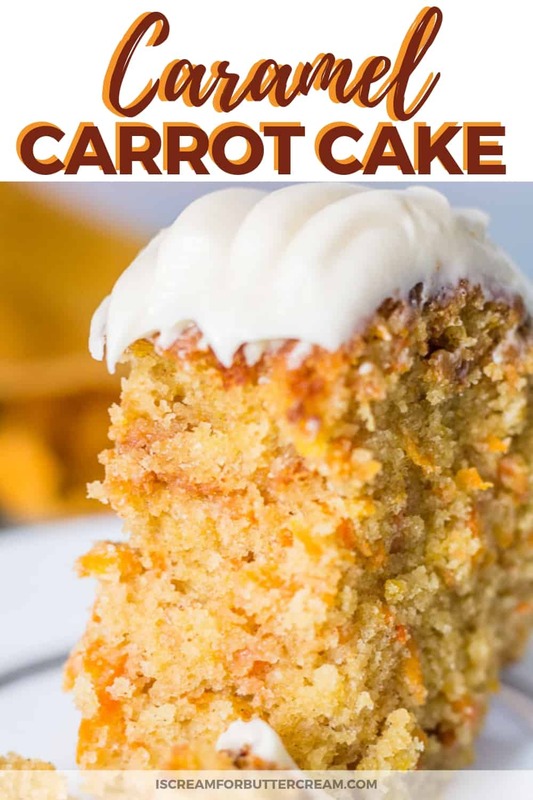 This is such a moist cake and the combination of the carrots, cinnamon and hint of caramel work so well together. You can't have just one piece. Preheat oven to 325 degrees. Grease and flour a bundt pan very well. Shred enough carrots to make 2 1/2 cups worth and set aside. Take 1 to 1 1/2 cups of the caramel chips and pulse in a food processor to break them up a bit. If you don't have a food processor, just put them into a large ziplock bag, seal it, and use a rolling pin to break them up. (You need the chips smaller, so they don't sink to the bottom when baking and to distribute the caramel taste throughout the cake better. Set the caramel bits aside. In a bowl, add the eggs, oil, milk and vanilla. Mix well and set aside. In a larger mixing bowl, add the flour, sugar, salt, baking powder, baking soda and cinnamon. Mix well. Pour the liquid mixture into the dry mixture and mix with a whisk or wooden spoon. Add in the carrots and chopped caramel chips and stir. Pour into the greased and floured bundt pan and bake at 325 degrees for about 55 minutes. Cool on a wire rack for about 15-20 minutes. Release from the pan and let cool completely on a rack. Microwave 1/2 a cup of caramel chips plus 1 tablespoon of milk for no more than about 30 seconds. (Just use what's leftover from the bag. ) Add another tablespoon of milk and mix well. Keep mixing until it's smooth. Set aside to cool off a bit. In a mixing bowl, mix the butter and cream cheese well. Add in the powdered sugar, vanilla and two tablespoons of milk. Mix well. Add in the melted caramel chips and mix well. If the glaze is too thick, add in milk by teaspoonful. You don't want it too thin though, or it will run off the cake and pool around the bottom. Once the cake is cooled, spoon on the glaze, or use a piping bag to drizzle it on. Store this cake in the fridge, since it has a cream cheese glaze. Allow to come to room temperature before serving, or microwave a slice for no more than about 10 - 15 seconds. Okay, what do you think? 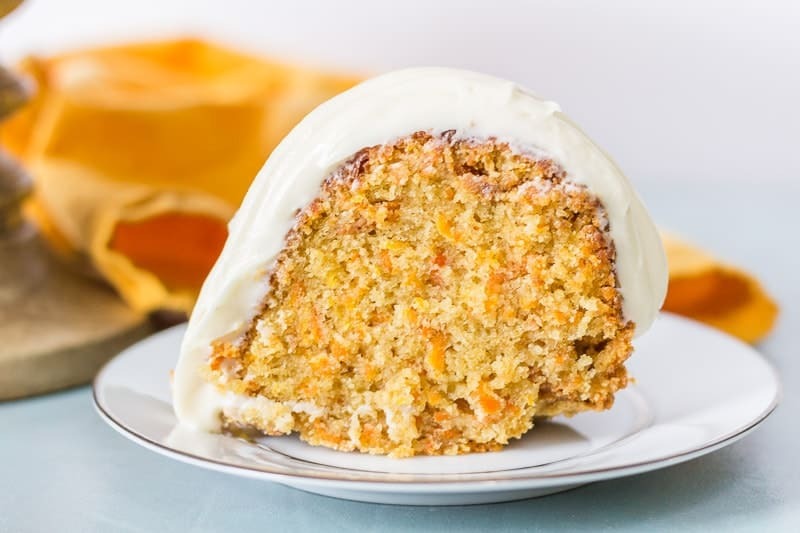 It’s a different take on the average carrot cake, right? I hope you enjoy it!